Description: This style offers additional coverage to our Shelissa, 9MC025 gown. 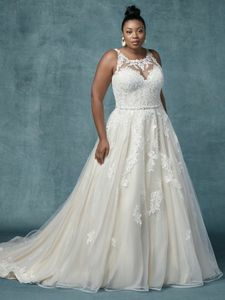 Lovely lace motifs dance over tulle in this ballgown wedding dress, completing the illusion halter over sweetheart neckline and illusion halter back. Finished with covered buttons over inner elastic and zipper closure. Beaded grosgrain belt accented in Swarovski crystals sold separately.